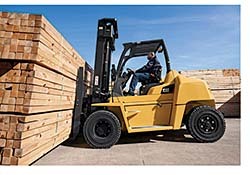 The 15,500-pound capacity diesel DP70N pneumatic tire lift model features the Perkins® 854E three-liter, turbo-charged, four-cylinder engine. The lift features a diesel particulate filter that burns off soot in the system as needed during normal operation. The lift features a three-section hydraulic control valve with fingertip controls, a full-suspension seat, and noise and vibration reduction features to improve operator comfort.